One of the features most missed by NetWorker users since the introduction of NetWorker Management Console has been the consolidated view of NetWorker activities that had previously been always available. This style of view used to be available in the old “nwadmin” program for both Unix and Windows, and administrators that came from historical releases which supported nwadmin have sorely missed that overview-at-a-glance monitoring as opposed to wading through separate tabs to see glimpses of activities via NMC. It’s sort of like the difference between looking into a building where the entire front wall is made of glass, or looking into a building where there’s 4 windows but to open one you have to close the other three. Is this compelling enough reason to run out and immediately upgrade to 7.6? Probably not – you need to upgrade based on site requirements, existing patches, known issues and compatibilities, etc. I.e., you need to read the release notes and decide what to do. Preferably, you should have a test environment you can run it up in – or at least develop a back-out plan should the upgrade not work entirely well for you. Is it a compelling enough reason to at least upgrade your NMC packages to 7.6, or install a dedicated NMC server running 7.6 instead of a pre-7.6 release? Quibbles – Why can’t I rename clients in the GUI? For what it’s worth, I believe that the continuing lack of support for renaming clients as a function within NMC, (as opposed to the current, highly manual process), represents an annoying and non-trivial gap in functionality that causes administrators headaches and undue work. For me, this was highlighted most recently when a customer of mine needed to shift their primary domain, and all clients had been created using the fully qualified domain name. All 500 clients. Not 5, not 50, but 500. The current mechanisms for renaming clients may be “OK” if you only rename one client a year, but more and more often I’m seeing sites renaming up to 5 clients a year as a regular course of action. If most of my customers are doing it, surely they’re not unique. This is not fun stuff. Further, the chance for human error in the above list is substantial, and when we’re playing with indices, human error can result in situations where it becomes very problematic to either facilitate restores or ensure that backup dependencies have appropriate continuity. Now, I know that facilitating a client rename from within a GUI isn’t easy, particularly since the NMC server may not be on the same host as the NetWorker server. There’s a bunch of (potential pool changes), client resource changes, filesystem changes and the need to put in appropriate rollback code so that if the system aborts half-way through it can revert at least to the old client name. As I’ve argued in the past though, just because something isn’t easy doesn’t mean it shouldn’t be done. Posted in NetWorker, Quibbles | Tagged: client, GUI, Index, NMC, Quibbles, rename | Comments Off on Quibbles – Why can’t I rename clients in the GUI? A few days ago a customer was having a rather odd problem. They’re currently running NetWorker 7.3.3 and getting ready to jump directly to NetWorker 7.5.1, but to do so they wanted to first run up a NetWorker 7.5.1 server and confirm current client types, databases, etc., will backup without issue*. So the customer installed NetWorker 7.5.1 on a new Linux host, created some devices and pools, but then encountered a particularly odd problem when they went to create the clients. NMC would allow them to fill in all the properties for the client, but when they clicked OK in the new client dialog box, nothing would happen. No errors were produced, but nor were any clients actually created. When they raised this with me I was a little puzzled for a few minutes, then asked if they were using the NMC that comes with NetWorker 7.5.1, or the NMC that comes with 7.3.3 and had just added the new server to the control zone. The answer was that the control zone for the existing NMC that came with NetWorker 7.3.3 was just extended to include the 7.5.1 server. For pools, devices and groups this was not a problem – these were all successfully created on the 7.5.1 server using the 7.3.3 NMC. However, when it came to clients, it wouldn’t work. The reason is quite simple – as new features and functions are added to NetWorker over time, different fields within a configuration resource may or may not become mandatory. Some of the time this is obvious, because we’re required to fill in certain fields – e.g., client names, schedules, etc. However, in other instances, NetWorker has predefined defaults that it slots into place if a value isn’t entered – e.g., parallelism, priority, browse/retention time, etc. Just because defaults are put into place however doesn’t mean that fields are any less mandatory – it’s all about allowing you to create resources quicker. So, what’s all this got to do with differing NMC/NSR versions? In short, everything! You see, what happened for this customer is that between NetWorker 7.3 and 7.5, there has been a raft of client based functionality added – e.g., data deduplication, support for defining a client as being virtual, etc. Attempt “client create” 7.3.3 -> 7.5.1. 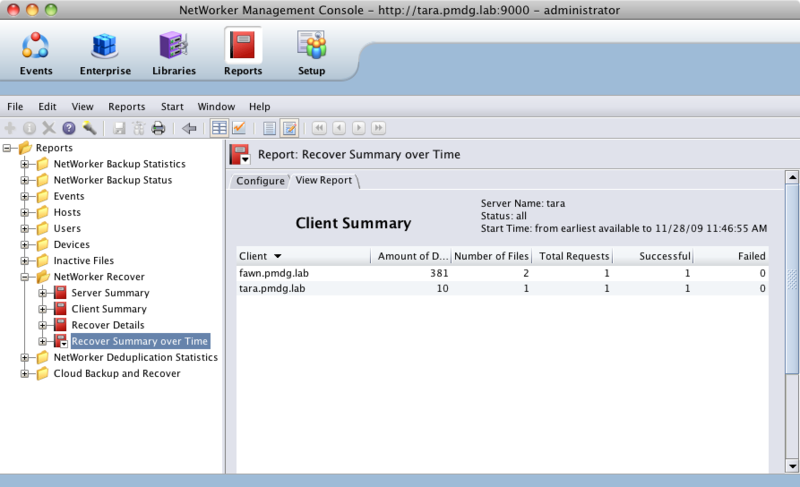 The 7.5.1 server rejects the proposed client resource as not having all the mandatory fields filled in. Should NetWorker/NMC have provided an error to explain what was going wrong? Undoubtedly that would have been good, and I’d suggest that NMC/NSR should be able to better communicate resource creation/update failure in these circumstances. However, that being said, the fundamental problem remained the same – the version of NMC in use couldn’t create new clients because it wasn’t supplying all the mandatory details to the more recent version of NetWorker. In many small sites, the NMC server and the NetWorker server are on the same host, and are thus upgraded in lock-step. However, for sites where the NMC server is installed on another host, this is a valuable lesson – unless you have a very valid reason, don’t run a version of NMC that matches an earlier version of NetWorker than the current server version. It may work (mostly), but if it does fail, it’s unlikely to be immediately obvious why it’s failing. * This is what I’d call an excellent upgrade policy – you can read the release notes until they’re 100% memorised, but nothing quite beats actually running up your own test server. What’s wrong with the NMC installation process? There is, in my opinion, an unpleasant security hole in the NMC installation/configuration process. The security hole is simple: it does not prompt for the administrator password on installation. This is inappropriate for a data protection product, and I think it’s something that EMC should fix. The NMC installation process is slightly different depending on whether you’re working with 7.5.x or 7.4.x and lower. Use the default username/password until you get around to changing the password. First person to logon gets to set the administrator password. Use firewall/network security configuration options to restrict access to the NMC console port (9000) to a single, known and trusted host, until you are able to log on and change the password. Be prepared to log onto NMC as soon as the installation (or for Unix, installation/configuration) is complete and trust that you “get there first”. In reality, the second option would not be declared secure by any security expert, but for small environments where the trust level is high, it may be acceptable for local security policies. The real solution though is simple: EMC must change the NMC installation process to force the input of a secure administrator password at install time. That way, by the time the daemons are first started, they are already secured. Posted in NetWorker, Security | Tagged: administrator, administrator password, NetWorker Management Console, NMC, Security | Comments Off on What’s wrong with the NMC installation process? For the most part cloning and staging within NetWorker are pretty satisfactory, particularly when viewed from a combination of automated and manual operations. However, one thing that constantly drives me nuts is the inane reporting of status for cloning and staging. While there have been various updates to cloning and staging reporting, and sometimes it at least updates how many savesets it has done, it continually breaks when dealing with the total amount staged/cloned in as much as it resets whenever a destination volume is changed. Oh, and while I’m begging for this change, I will request one other – include in daemon.raw whenever cloning/staging occurs, the full list of ssid/cloneids that have been cloned or staged, and the client/saveset details for each one – not just minimal details when a failure occurs. It’s called auditing.